You're ready to create your first message. Learn how to get started here. The below steps will walk you through the process of creating your first message, but it's important to note that we won't cover every available option and setting that Listrak offers. This article serves as a beginner's guide for getting up and running quickly. 1. Make sure you are on the list from which you want to send your email. Select the list from the list navigation on the left-hand side of the home screen. 2. Navigate from the home menu to Authoring. 3. Go to New Message. From Name: This field defaults to what you have already listed in the "From Name" field in your List Settings, but can be changed here. It is most likely your company name, but can be anything you choose. From Email: This field also defaults to the email address you listed in the "From Email" field in your List Settings, but can be changed here. TIP: To stay in compliance with CAN-SPAM, include a working return email address. Replies will be sent to the from address unless you specify otherwise in the Reply-To Email field below. Reply-To Email: This field designates an email address for recipients to respond to that is different from the "From Email." NOTE: This field is not required. Also, the suggested example text (example@domain.com) will not appear in the your sent message if you leave the field blank. Subject: Subject is a required field. The watermark (required) will disappear when a subject line is entered. 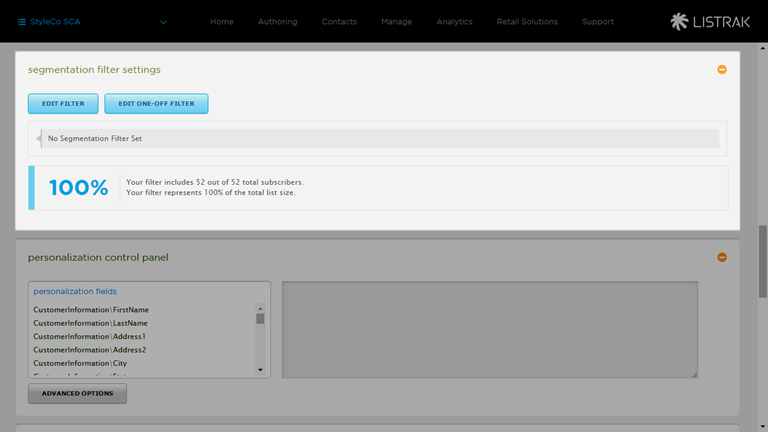 Listrak will not allow the message to deploy without a subject line. It will be visible to recipients in most email clients prior to opening the message. It is helpful if your subject line contains a brief, yet interesting, relevant, and persuasive description of the message. TIP: Don't know where to begin writing a subject line? Check out our blog post Inboxes are Where the Opens Happen for more insights and ideas. Click the heart icon to add symbols to the subject line. Symbols render differently depending on the email client your contacts open the message with. You can read more about symbols and how they render in various email clients in the Listrak Symbols Guide. Preheader: This field helps eliminate adding preheader copy within messages. The text that is entered here will appear in the inbox to support the subject line, but won't display in the message. Campaign: This field groups related messages together. It's best to structure your messages by grouping them into campaigns because this allows you to view the results of your message performance across the entire campaign, rather than having to add up stats from each individual message. You have several options for this field: add a new campaign by typing the name of the campaign in the text field. 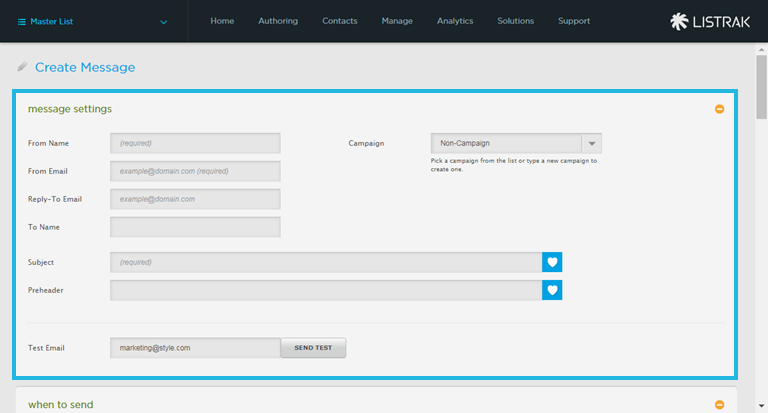 If you want to add your message to an existing campaign, select the campaign name from the drop-down list. Choose "Non-Campaign" if you have a stand-alone message that doesn't need to be associated with any other messages. NOTE: All Non-Campaign messages will be grouped together for analytics purposes in a group labeled "Non-Campaign." Test Email: This field defaults to the email address of the user of the account. You can change the address here, however, you are limited to only one email address at a time. 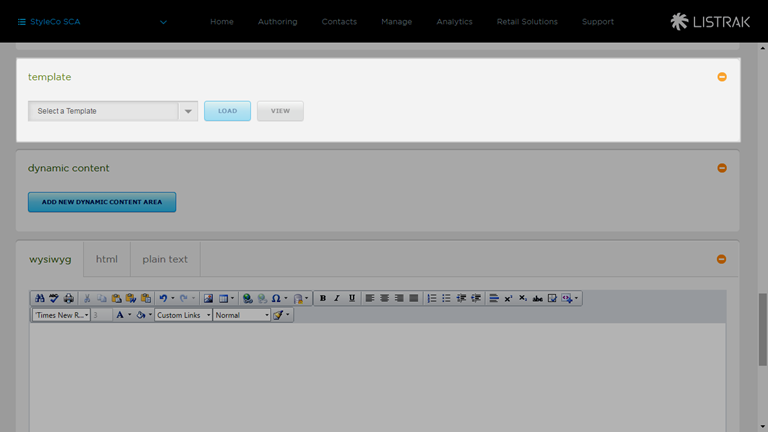 By clicking Send Test, you can deploy a test version of your message to the email address in this field. Your test email will explicitly contain "TEST" in the subject line so you can easily identify them. TIP: Use this feature to test how your message will render, or look, in different email clients such as Google, Yahoo, or Outlook. NOTE: This field will only accept one email address. To send a test message to multiple recipients, you can use the review group setting. Read more about how in Send Test Message to Multiple Recipients. Once: The message will be sent one time only. Immediately: The message will be sent as soon as you click Send To List on the confirmation page. Daily: The message will send every "X" number of days, as determined by you. Weekly: The message will send every "X" number of weeks, and on certain days of the week, as determined by you. Monthly: The message will send every "X" number of months, and on certain days, as determined by you. Scheduled: The message will be sent once, on the date and time you specify. NOTE: Scheduled time is based on Eastern Standard Time. 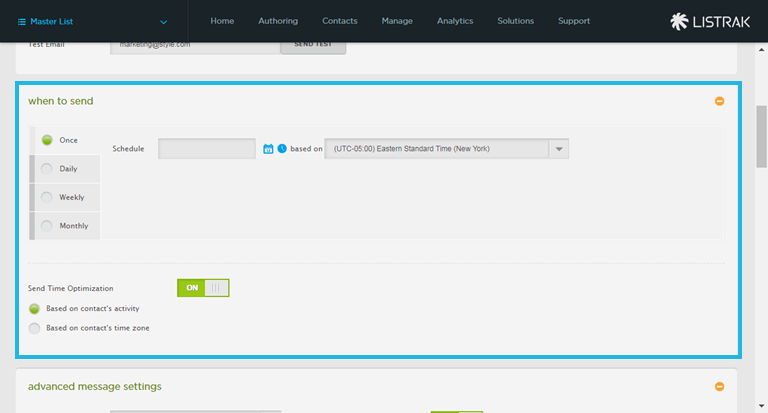 Send Time Optimization: This feature allows you to customize your message send time based on time zone and activity. 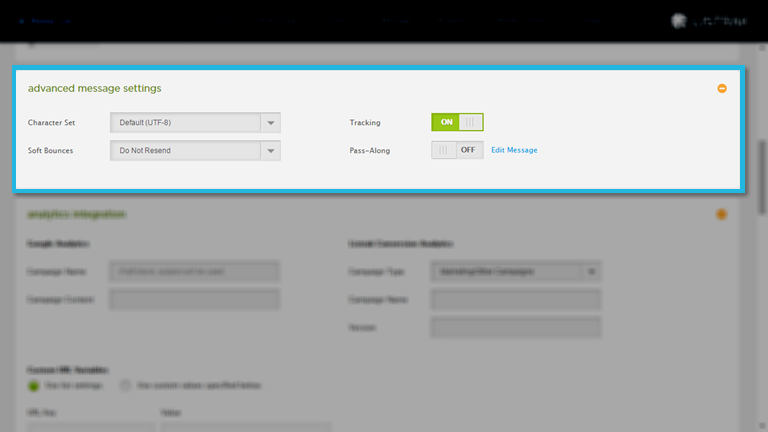 By toggling Send Time Optimization to "yes," you will see two options to send based on either of these two criteria. For examples of message send schedules and options, read Scheduled and Recurring Messages. 6. Select your optional advanced message settings. Advanced settings include rarely used features such as Soft Bounce Resend, Track and Pass-Along, or Character Sets if enabled in the list settings. To learn more about advanced settings, read Advanced Message Settings. NOTE: We recommend that you keep the default settings in this section. 7. Select your segmentation filter settings. Here you have the option of sending to a segment of your list or to the entire list. If you do not modify these settings, you'll send your message to your full list. 8. 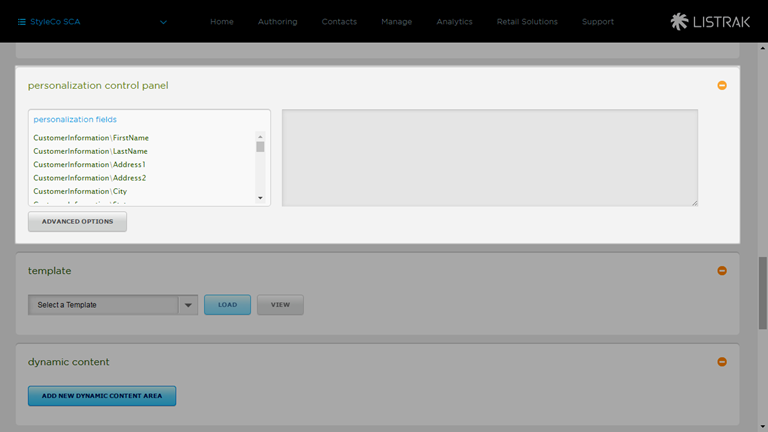 Obtain code for personalization in your email in the personalization control panel. This is optional but allows you to do things like including each contact's first name in the subject line or body of the message. 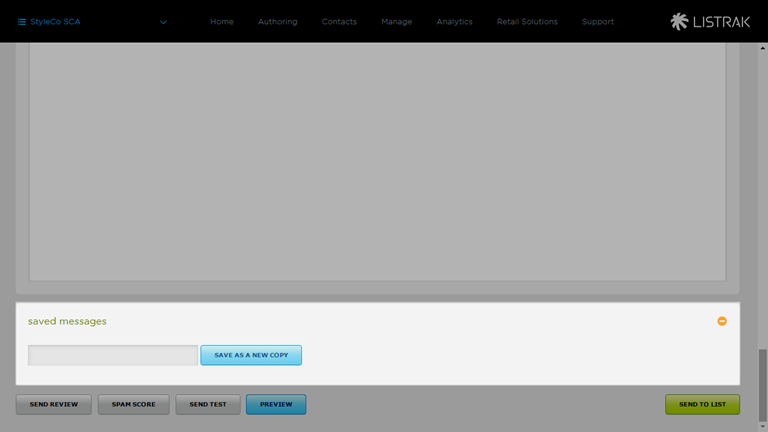 Click on the personalization field you want to use in your email. The code for the field will appear in the right-hand side of the screen. Copy this code and paste it wherever you want to add the specific attribute. Since this is an HTML code snippet, you can paste it anywhere within the subject line or body of the message. To learn more about using personalization fields and how to use the advanced settings, read Personalize Content with Segmentation Fields. 9. If desired, select a template from the drop-down menu. You can make your own template, or have Listrak design a responsive template for you. 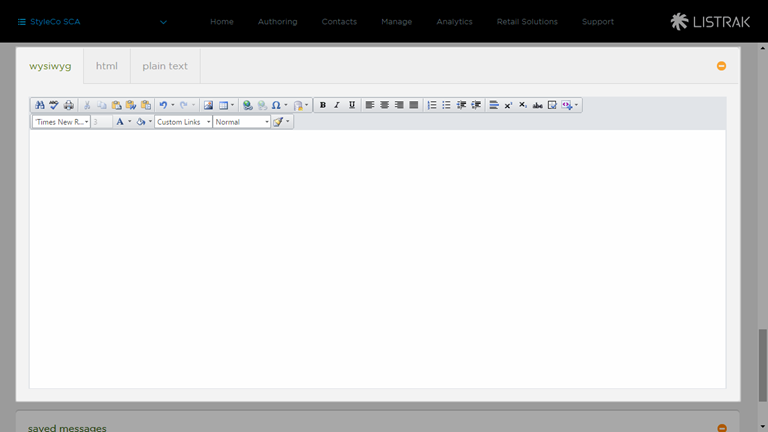 Listrak offers a library of pre-designed templates as well that can be accessed from the Authoring menu. If you would want to use a pre-configured system template, navigate from the home menu to Authoring > Predesigned Templates. To create your own template, navigate from the home menu to Authoring > Content & Media > Templates. 11. Now that your message settings and content are in place, you can save your message by clicking save as a new copy. It is best practice to save every message before actually sending it. The message name defaults to the subject line, but you can rename it by typing in the field. Congratulations! You've just created your first email message.